With a stay at Hotel Sympozjum & SPA, you'll be centrally located in Krakow, within a 15-minute drive of Wawel Castle and Main Market Square. Featured amenities include complimentary wired Internet access, limo/town car service, and express check-in. Planning an event in Krakow? 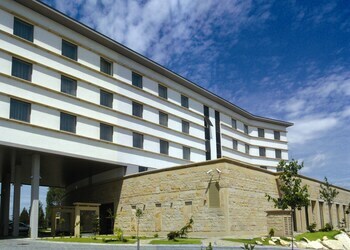 This hotel has 5996 square feet (557 square meters) of space consisting of a conference center and meeting rooms. For a surcharge, guests may use a roundtrip airport shuttle (available 24 hours) and a train station pick-up service. Located in Darlowko, Hotel Zamkowy is a 1-minute drive from Castle of the Duke of Pomerania and 9 minutes from Darlowo Port Beach. Free self parking is available onsite.